As most schoolkids know, Hansel and Gretel were two German siblings who got lost in the woods and stumbled upon a remote cottage built entirely from edible gingerbread. However, the cottage was owned by a particularly nasty witch who, in response to the children's consumption of her home, wished to eat the children. Good clean family fun. 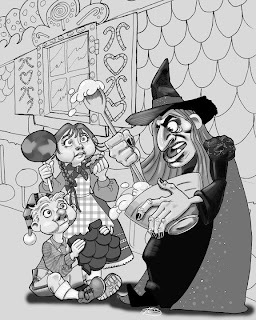 At Pinocchio's, "Hansel and Gretel" was one of the first marionette shows presented. The character design was a little stiff and awkward, without the wonderfully caricatured proportions that developed over the years. Rather than using the original designs to illustrate the story, I adapted the Witch design from Pinocchio's version of the Wizard of OZ. Hansel was modified from the lead of Jack and the Beanstalk and Gretel was pulled from my imagination. I did try to keep the children's wardrobe as accurate from the original puppets as possible. As a technical note, I drew the Witch on one page, the children on another, and the background on yet one more, scanned them in separately, then merged and rendered them in Photoshop. this is great. I love what you did..We need to see you especially since you are so close..I wanted to chat with you about something...e-mail me..